It's been announced that Arashi members Sakurai Sho and Matsumoto Jun will make guest appearance on fellow member Ohno Satoshi's upcoming special drama "Mou Yuukai nante Shinai". �This special drama is a comical mystery about a freeter (Ohno) who receives the odd request to fake the kidnapping of racketeer boss daughter, (Aragaki Yui). Sakurai will appear in the special drama as the butler "Kageyama" which is from Sakurai's ongoing drama "Nazotoki wa Dinner no Ato de", while Matsumoto will make an appearance as "Tokita Shuntaro" which is from Matsumoto's upcoming "Getsu9" drama "Lucky Seven." The announcement for Sakurai and Matsumoto's guest appearance on Ohno's drama was made during the press conference for "Fuku Arashi" campaign which is to promote the special TV programs on Fuji TV in which Arashi appears at the end of the year and New Year season. 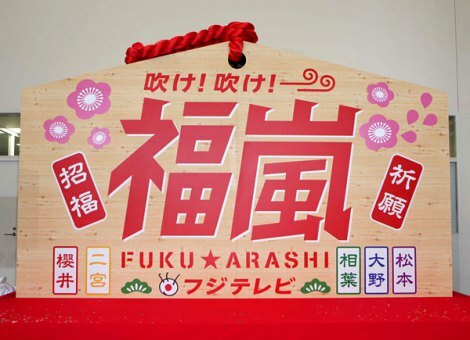 �There will be a special CM for the campaign starring Arashi during December 17th ~ January 3rd for a limited term, and on Fuji TV's official site, there will also be an original game "Fuku Arashi Warai." At the press conference, Sakurai who received the script for the drama a few days ago, commented, "I saw Ohno's name on the first page, and my name and Matsumoto's name on the following pages on the script. �I'm happy to see it, so I am carrying it around with me everyday." �Matsumoto also commented, "He (Ohno) has different atmosphere at the shoot for drama which is not Arashi-like. �So I'm looking forward to see it at the shoot." On the other hand, other members Ninomiya Kazunari and Aiba Masaki seem to be little dissatisfied, as Aiba said to Ohno at the press conference, "Ohno-kun, what about us? Though we don't have any role we have with us right now, it's not too late if you guys are still shooting. �Where are you guys filming at? ", and Ninomiya also said, "I haven't been offered yet. I don't mind if I have to meet you at the filming location." �Unfortunately, Ohno refused them saying, "Not this time." Therefore the two said while�consoling�each other, "Shall we do our best on 'VS Arashi' then?" "Mou Yuukai nante Shinai" is scheduled to be aired on January 3rd on Fuji TV.